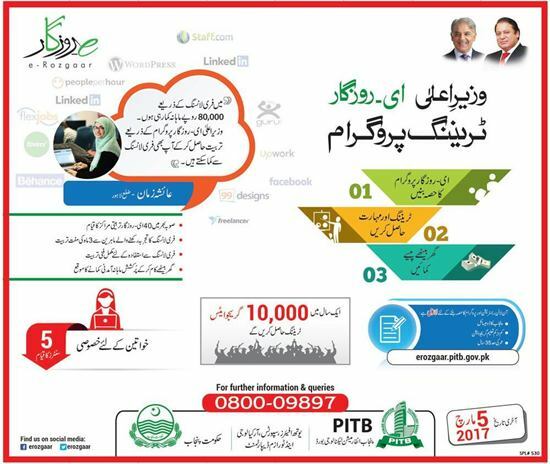 e-Rozgaar is an initiative started by the Government of Punjab with the objective of providing training opportunities to youth to minimize unemployment using internet based freelancing. It is a free training, candidates don’t have to pay any fee but he will not be awarded any stipend. Duration of this course is 3.5 months and last date to apply is 05 March 2017. Minimum age to apply is 22 years and maximum age to apply is 35 years. e-Rozgaar Centers will be in all the 36 districts of Punjab.